I love the dainty borders and corners and leaves...it's all so lovely together! This is gorgeous Sylvie. I love the yummy image, pretty colours and a fabulous layout too. As you know it's blinking freezing here! This is adorable Sylvie, lovely pastel colours. What a pretty card. The colours are so soft and pretty and the cupcake looks wonderfull withthat bit of sparkle! Beautiful colours on this card and so many gorgeous embellishments. I hope you manage a bit of nice weather alongside all the socialising. It will be lovely to catch up with your family and friends. Lovely, lovely make. Fantastic use of your dies, looks beautiful! Lee Ann's Mom is gonna love this! What a Yummy card design, love the colors and design. 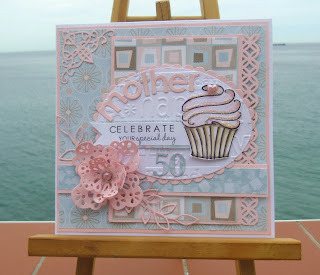 What a pretty card-love your layout and that cuppycake just looks so yummy ! Hi Sylvie, this is fabby. Love the cupcake and the soft colours. She'll love it. Enjoy the rest of your UK stay. Great card Sylvie, love your colour combos! Thank you for entering for the RTG Design Team call, we are in the process of looking at all the entrants at the moment and will announce the new DT members soon.